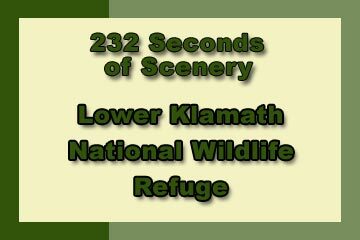 Lower Klamath National Wildlife Refuge - Explore! 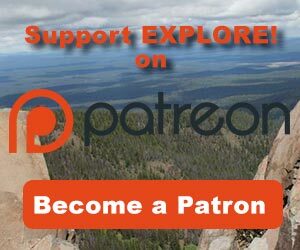 Lower Klamath National Wildlife Refuge - Explore! 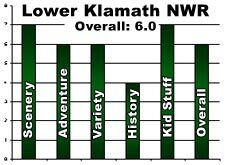 As the above map shows, there are six National Wildlife Refuges in the Klamath Basin. 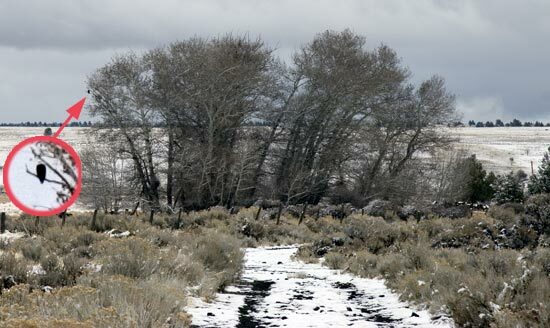 The Lower Klamath Refuge was the first to be designated, in 1908, and also the first in the United States intended to provide refuge to waterfowl. Physically, the refuge is flat. Before human modification, this area was a shallow lake, known as Lower Klamath Lake. The lake formed to the east of the Klamath River, from river overflows. 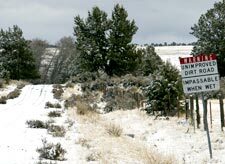 It is bordered to the east by Sheepy Ridge and the South Klamath Hills and to the south by the Medicine Lake Highlands. A field with grain left for bird food. The Klamath Reclamation Project diked and drained the area to provide outstanding farmland. Canals move water to various parts of the farmland and, in conjunction with management for crops, the water also goes to the refuge. In addition, flows from the Lost River, to the east, can be pumped from the Tule Lake National Wildlife Refuge through Sheepy Ridge to the Lower Klamath Refuge. Farther upstream, water can be diverted from the Klamath River into the Lost River or vice versa. This unique water management system makes the refuges fully interdependent with adjacent farmlands. This has proven to be beneficial for the refuge to the extant that an objective for the refuge is to integrate the maintenance of productive wetland habitats and sustainable agriculture. Land within the refuge is leased to farmers so that they can grow crops. As part of the deal, a portion of the crop is left for the birds to eat. 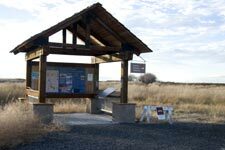 A kiosk with interpretive information near the main entrance to the refuge. The refuge is partially in Oregon and partially in California. The two parts are separated by State Line Road (Highway 161) that connects US 97 on the west to Highways 39 and 139 on the east. There are places to park along State Line Road including a site with several interpretive signs from which many species of birds can be seen. 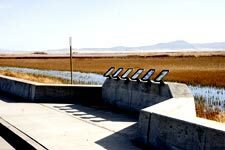 The refuge offers a designated, 11-mile-long, auto tour route that includes several interpretive panels to help visitors understand the birds of the area and its importance on the Pacific Flyway. In addition Township Road borders the north edge of the refuge. Generally, if you are looking for wildlife, it is best to stay in your vehicle so as not to frighten the birds. Thus, most access to the refuge is on roads. I went a little further, by driving up a four-wheel-drive route that leads to the top of Sheepy Ridge, to the east of the refuge. This provided a broad view of the entire refuge with Dome Mountain and Mount Shasta in the background. A week or so later, I took a more adventurous route around the west and south of the refuge. As a waterfowl refuge, waterfowl are the big story here. My visit, in early November, wasn’t a particularly good day to see masses of waterfowl, however, refuge staff reported around 1,000 sandhill cranes on the refuge the day I visited. You can see and hear some of them in the video below. It was a windy day, with lots of dust in the air so most of the waterfowl were resting in protected areas, generally far away from my camera. Binoculars are a necessity for quality observations. I drove the auto tour route as well as Township Road. At the time of my visit, a bridge was under construction so Township Road had to be driven from both ends rather than straight through. 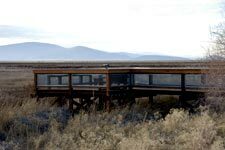 What you see will vary considerably by the day you visit the refuge. The best time to see the wildlife is early morning. From December to March you’ll see lots of bald eagles when the largest wintering population in the lower 48 congregates in this area to feed on waterfowl. Also in the winter, around 30,000 tundra swans make the refuge their home. You may even see a rare whooper swan on the White Lake unit near the intersection of Merrill Pit Road and State Line Road. In the spring you will see nesting Canada geese, cinnamon teal, American avocet, black-necked stilt, and Wilson’s phalarope. The spring and fall migrations bring thousands upon thousands of white-fronted geese, Canada geese, snow geese, Ross’s Geese, green-wing teal, American widgeon, and ducks of all sorts to the refuge where they feed and rest. Other birds you might see during the migrations (November and late March) include short-eared owl, dunlin, marbled godwit, western sandpiper, semipalmated plover, pectoral sandpiper, red-necked phalarope and black-bellied plover. There are many other species of water and shore birds that visit the refuge. The refuge also offers great habitat to a wide range of raptors besides bald eagles. Northern Harriers dominated the sky on the day of my visit. Other species that are commonly seen include rough-legged hawk, Swainson’s hawk, red-tailed hawk, golden eagles, prairie falcons, great horned owls and American kestrel. Township Road, that parallels State Line Road to the north, is a great place to see raptors sitting on power poles awaiting their next meal. Beyond the 275 species of birds that have been seen here, the refuge is a haven for raccoons, muskrat, mink, antelope and mule deer. Begin on Indian Tom Road at its intersection with State Line Road just east of Hwy 97 (N 41˚ 59.991′ W 121˚ 53.337′) . Proceed southward on Indian Tom Road around Indian Tom Lake for about 1.3 miles until you come to Sheepy Creek Road (N 41˚58.911′ W 121˚ 52.711′). Turn left on Sheepy Creek Road and continue about 6.4 miles to Dorris-Brownell Road (N 41˚ 55.192′ W 121˚ 48.972′). Turn left on Dorris-Brownell Road and travel about 2.7 miles to the intersection with Willow Creek/Red Rock Road (N 41˚ 54.528′ W 121˚ 46.909′). Turn right on Willow Creek/Red Rock Road and proceed about 4.7 miles to a second intersection with Dorris-Brownell Road (N 41˚51.436′ W 121˚ 45.257′). Do not turn here, but proceed straight, on to Dorris-Brownell Road. You will see an historical marker about the Applegate Trail on the right about 0.2 mile past the intersection (N 41˚ 51.434′ W 121˚ 45.028′). In another 1.5 miles you will arrive at the beginning of the Lower Klamath Lake Road (N 41˚ 52.346′ W 121˚43.769′). Turn right on Lower Klamath Lake Road and precede about 0.3 mile where you will find a green gate (N 41˚ 52.298′ W 121˚ 43.484′). If the weather is good and the road is dry, you may be able to go farther, but generally you can stop at the gate. The eagles roost in the cottonwood trees that are straight ahead. This is not a loop tour, so return to State Line Road the way you came. 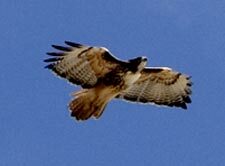 On the day of my visit I saw two eagles, including the one below, several other raptors and lots of magpies. At other times of the year, you can see bluebirds, solitaires, pygmy owls, tri-colored and red-winged blackbirds, and northern shrike along this route if you are familiar with their various habitats. Human history precedes the formation of the refuge. The Applegate Trail traversed the area. It offered immigrants an alternative to the perilous “last leg” of the Oregon Trail down the treacherous Columbia River. You can still see the ruts made by the wagons as they crossed Sheepy Ridge, just south of State Line Road. There is an historical marker there and another south of the refuge (N 41˚ 51.434′ W 121˚ 45.028′). You may also want to stop at the Landrum Historic Wayside on Highway 97 just north of State Line Road (N 42˚ 00.239′ W 121˚ 53.371′) to get a broader view of the history of this area including the importance of Mexico in that history. On July 4, 1846 Captain Levi Scott, Jesse Applegate and David Goff and the rest of the pathfinders laying out the Applegate Trail came to this spot. The park was dedicated on July 4, 1996 to commemorate the 150th aniversary of the Applegate party’s visit. Before the settlers, the area was home to the Modoc Tribe and its predecessors. While the main part of the refuge is flat, the foreground scenery includes a good variety of water and field habitats while the background is studded with mountains. “The Road Less Traveled” brings the volcanic landscape much closer. If you take “The Road Less Traveled” in winter, you will have a greater adventure than just driving the auto tour route. There is a lot of variety in geography, if you take in the whole area, as well as wildlife, particularly birds, and the history of the Applegate Trail. The adventure is fine for kids and they will enjoy the wildlife. It is, however, primarily an auto adventure so there are limited opportunities for them to explore on their own. Overall, I rated this adventure a 6.0 on out 1 to 10 scale. If you’ve been here, please offer your impressions in the comment form below. All photos and text by Jerry Haugen, pathfinder. Jerry also shot and edited the video. All materials are ©2010, Global Creations LLC. All Rights Reserved. Thanks for the kind words and the heads-up. I found that typo twice. Both are now fixed. Not a huge deal but I think the final GPS address in the Road Less Traveled Section is incorrect. The longitude coordinates are preceded by “N” and I believe you mean “W”. 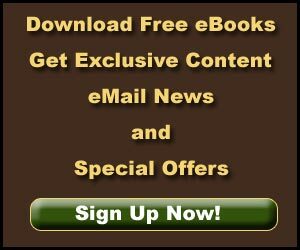 N41˚ 52.298′ N 121˚ 43.484′ vs.
Great website. I have used much of it to find bald eagles and capture many photos. Nice to see so many baldies out there.